Hey everyone, there’s this movie franchise called Star Wars, and there’s also this theme park called Walt Disney World. Put them together, and people are flipping out. That’s what happened this weekend when news was released at the D23 EXPO 2015 that Star Wars-themed lands will be coming to Disneyland in Anaheim, California, and Disney’s Hollywood Studios at Walt Disney World Resort in Orlando, Florida. Can’t say we blame them, as THIS IS THE BEST NEWS EVER! 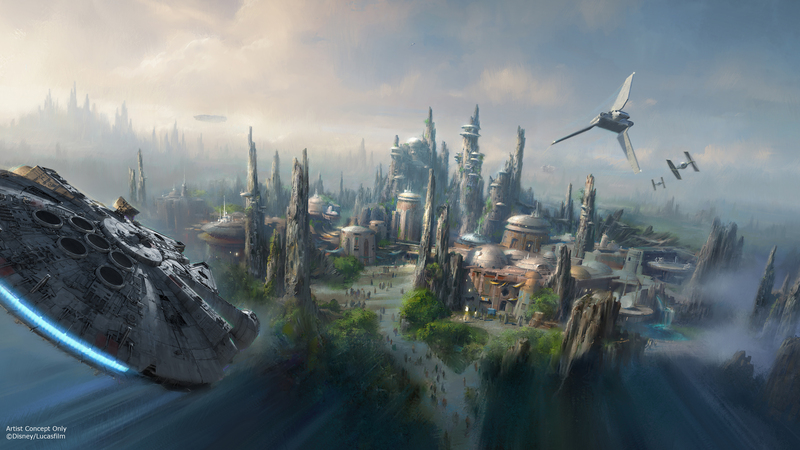 The new themed lands will be 14 acres large and feature a remote trading port and the opportunity to get behind the controls of the Millennium Falcon. The Star Wars news isn’t the only themed land Disney announced at D23. There are also plans for a new Toy Story Land at Disney’s Hollywood Studios, Pandora-The World of AVATAR at Disney’s Animal Kingdom, and a Marvel attraction for Hong Kong Disneyland. Speaking of love, let’s get back to Star Wars. From the Disney press release, here are details about the new themed-land experience. Star Wars Launch Bay – This interactive experience will take guests into the upcoming film, Star Wars: The Force Awakens, with special exhibits and peeks behind-the-scenes, including opportunities to visit with new and favorite Star Wars characters, special merchandise, and food offerings. Star Wars Launch Bay will be located in the Animation Courtyard at Disney’s Hollywood Studios and in Tomorrowland at Disneyland park. Jedi Training Academy— A favorite of younger fans is re-imagined with a new experience that includes new characters and a new villain to battle from the popular Disney XD series Star Wars Rebels. Season of the Force – This new seasonal event, beginning early 2016, brings new experiences to both coasts. In Tomorrowland at Disneyland park, guests will explore the Star Wars galaxy with special entertainment throughout the land, themed food locations, and more. Guests also will be thrilled to climb aboard Hyperspace Mountain, a re-imagining of the classic Space Mountain attraction, in which guests will join an X-wing Starfighter battle. At Disney’s Hollywood Studios, guests will close out weekend nights with a new fireworks spectacular set to the iconic score of the Star Wars movies.